An in-depth article by Colin Bossen, about the IWW affiliated Chicago Couriers Union, which modeled itself off of a conception of 'solidarity unionism'. IWW member Colin Bossen delivered a talk on the IWW’s Chicago Couriers Union at the Provisions Library in Washington, DC on June 8. The Institute for Anarchist Studies and Provisions Library supported his work along with the CCU organizers interviewed. This article is an edited version of his presentation. Lynd’s solidarity unionism has six basic characteristics: voluntary membership, no dues check-off, no paid officers or staff, democratic decision-making with everyone empowered to “criticize frankly and fully”, a focus on direct action rather than collective bargaining agreements, and internationalism that seeks to build networks of workers “across boundaries of nation, gender, and religious faith.” Lynd contrasts solidarity unionism with the business unionism of the large AFL-CIO and Change to Win unions. Lynd identified three characteristics inherent to business unions: being government- sponsored monopolies that [try] to force all persons working in a particular shop to join the union and deducts dues directly from a workers’ paycheck; agreeing to collective bargaining agreements that grant management exclusive power to make the crucial on-the-job and investment decisions alongside a no-strike clause prohibiting direct action of all forms during the contract; and, undermining and preventing the formation of independent labor parties, locally and nationally. Business unions are “organized from [the] top down,” devoted to keeping the labor peace and relying on paid staff who don’t include workers in processing grievances or making decisions. While past IWWs may have practiced something like solidarity unionism, this organizing theory was introduced to the IWW in 2000 by the IWW’s then- General Secretary-Treasurer Alexis Buss. “We must stop making gaining legal recognition the point of our organizing. We have to bring about a situation where the bosses, not the union, want the contract. We need to create situations where bosses will offer us concessions to get our cooperation,” said Buss in her Industrial Worker column. A union is not a union because it gets legal sanction from the government or a contract from the boss, said Buss in another column. Rather, a union is simply any “organized group of workers” that comes together to have “more potential power than unorganized individual workers.” This redefinition of the union shifted the power back to workers. In the United States, any group of workers engaged in concerted activity has legal protections under the National Labor Relations Act. These rights include presenting grievances, working together, making demands on the boss, seeking meetings, and even striking. Buss also encouraged wobblies to look at the work of two of Lynd’s mentors, Stan Weir and Martin Glaberman. Weir and Glaberman were both working class intellectuals who wrote about the structural problems of the American labor movement. Weir spent much of his life working as a sailor, a longshoreman or an autoworker in California. Glaberman was a Detroit autoworker. Glaberman’s work focused on the problems inherent in union contractualism specifically how labor contracts could turn the union into a cop for the boss, enforcing discipline among the union’s members. Glaberman had a second key insight that “activity precedes consciousness.” This meant that people respond to workplace situations emotionally before they respond rationally and often take actions in a way that contradicts their presupposed beliefs, and in the case of unions, contractual agreements. Glaberman’s favorite example of this was during World War II when workers at the autoplants would sign no-strike agreements with management and then would spontaneously go on strike over safety issues. The campaign to organize what is now the Chicago Couriers Union began among young members of the Chicago General Membership Branch of the IWW who decided that they wanted try to organize a solidarity union. In Fall 2003, several members of the Chicago IWW met and decided to organize the courier industry in Chicago. The couriers had no union or prospect of a business union interested in organizing them. The industry’s high turnover and unique subculture seemed to be well suited for a solidarity unionism campaign. At the same time, these traits made winning a National Labor Relations Board-sponsored election at a single company unlikely. Chicago has dozens of messenger companies. Messengers also potentially have an enormous amount of power on the job. Packages must be delivered in a set amount of time; it was possible for a courier to use direct action to delay and disrupt a company’s business. In theory, couriers could be organized around specific grievances rather than the idea of a union contract. The IWW also had a recent history of organizing in the courier industry. From 2000-2002, Wobblies in Portland had built a union of bike messengers that succeeded in winning a number of substantive demands, including a pay raise, at Transerv, one of the larger messenger companies. Only the International Longshore and Warehouse Union (ILWU) in San Francisco, had created a similar organization. The Chicago IWWs felt this experience would give the IWW legitimacy among messengers and that they could draw directly on the wisdom gained by other IWW organizers through their own struggles. IWW members had begun already to develop a few relationships with messengers. This meant that getting a foothold in the industry would be easier. Although no one in the IWW knew it at the time, members of the bike messenger community had been shopping around for a union for several months before conversations between messengers and IWW members even began. 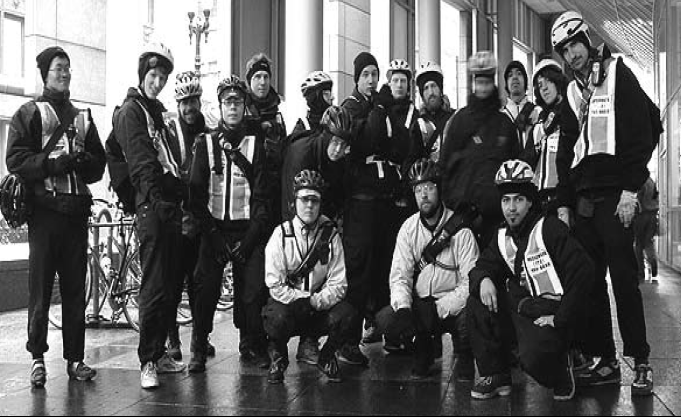 In June 2003, there had been an effort to create a Windy City Bike Messengers Association (WCBMA). The effort was led, in part, by Andrea Murphy and was the third attempt at creating a bike messenger association in the city. Murphy had participated in the WCBMA with the clear intent that it would become a union and had even gone so far as to attend a weekend training put on by the AFL-CIO. Under Murphy’s guidance, the first act of the WCBMA had been to invite a trainer from the AFL-CIO Organizing Insitute to meet with messengers. While about 40 people attended the meeting nothing substantive came of it because the AFLCIO trainer told the messengers they needed to organize before even approaching a union for help. The initial purpose of the WCBMA had been “to tackle on-the-job issues” but after the AFL-CIO meeting this focus was eventually lost. As the WCBMA unravelled, the IWW stepped into the vacuum. Conversations between the remnants of the WCBMA and the IWW’s organizing committee resulted in the decision to bring IWW organizer and former bike messenger ‘Lil Pete out from Portland for a week. During Pete’s time in Chicago, he spoke with Chicago messengers about organizing with the IWW and the union held a public forum to discuss the idea. After flyering and word of mouth, a publicity a forum was held in mid-December 2003. At least 40 people came, many were veterans of the industry. There was both excitement and fear about the possibility of forming a union. Grievances began to emerge, in particular, several people were upset about being independent contractors rather than employees. There was also talk about next steps and a general sense that security was important. Messengers feared losing their jobs. At the meeting, Pete outlined a basic strategy for building the union. He argued that the first two tasks of organizing a union were to develop a social map of the industry and gather a contact list for as many workers as possible, so it was best to keep the organizing quiet. The meeting ended with plans to hold another information meeting and proceed from there. A questionnaire was circulated, but few people filled it out in time for the next meeting. The information asked for was the number of people in the company, their names, contact information, demographics and social groupings, and the owner of the company. The second information meeting was held in a messenger’s home. More than 20 people came. Few people had filled out the survey, so discussion turned to their working conditions and what could be done about them immediately. Arrow Messenger Service had recently instituted a policy that called for messengers to cover their tattoos and remove piercings. Chicago bike messengers, particularly white messengers, tended to have a lot of piercings and tattoos. People were pissed off. The IWW organizers at that meeting wanted to build infrastructure and lay campaign groundwork, rather than do a strike or job action so the meeting ended without a clear plan of action. The IWW organizers decided to build the courier union’s infrastructure, map the industry and gather contacts. The organizers also recognized they lacked the experience, so petitioned the General Executive Board for funds to bring in Pete to kick start the campaign. With the funds approved, Pete planned to come to Chicago from late March to mid-June to teach workers how to organize, handle grievances and devise strategy. Before Pete arrived, things began to get hot at Arrow. A few of the messengers had reached a breaking point and wanted to strike over the new tattoo and piercing policy. They invited two of the IWW organizers to attend a meeting where they discussed what to do. The organizers talked them out of striking, reasoning that they did not have the support or organization to win. In retrospect I cannot help but wonder to what extent we performed the function described by Glaberman of keeping workers in check in that case. On the other hand, the messengers in question probably would have never thought of striking without having talked to the IWW in the first place. In her final report as a CCU organizer Andrea Murphy is critical of the IWW organizers. “A couple of messengers at Arrow were feeling exploited enough to want to do the most daring thing they could do in their position. In the end, the outcome was no different than it would have been had they been fired [most of the messengers in question quit Arrow]. Because of the desire to keep the campaign undercover and the (imagined) responsibility they assumed for the results of the campaign, a genuine passion to do something was stifled. “I challenge every organizer...to think about how best to direct energy rather than subduing or controlling it. Consider what it might look like to lead from behind. I caution against talking anyone out of doing anything, as this requires too much influence over the passions of peoples,” said Murphy. In this instance, the IWW organizers had begun to make decisions about the direction of the campaign without real input from workers in the industry. We wanted people to think and act strategically while they often wanted to solve their problems immediately. As organizers from outside the industry, we were not initially accountable to the messengers. They had not elected us and the power that they had over us essentially amounted to whether they participated in the activities that we organized or not. It took several years to break this pattern. Our strategies would prove later on to have limited, if any, success. With organizing at Arrow stifled, we began the task of building an Industrial Organizing Committee. We selected a group of four workers to be its first members. They were chosen because we thought them to be leaders within the messenger community. All four of them were white and all former WCBMA members. One of the first tasks we set for the group was to recruit members who more accurately represented the demographics of the messenger industry. About half of the couriers in Chicago are black and we realized that we would never be able to organize the industry without a union that reflected the people in the industry. We also developed a larger strategy for the campaign based on Pete’s experiences in Portland, the theory of solidarity unionism and studying the industrial union structures of the IWW in the twenties and thirties. Our idea was that we would organize two types of committees. The first would be shop committees composed of members of the union who worked at a particular company. They would handle the grievances that arose at that workplace. Each shop committee would elect a member to serve on an industry wide organizing committee that, in turn, would handle the grievances that could not be dealt with on a company by company basis. Once the union got strong enough the industrial organizing committee, we would issue a set of demands for industry- wide standards and then go about trying to enforce these through direct action. The members of the industrial organizing committee selected the other members of the committee, often with heavy input from Pete, MK and I.
Chicago Couriers Union pickets the Lasalle building in 2007. Photo by X353650. The goal was to develop the shop committees to the point where they would elect their own representatives to the IOC. This never happened, probably because the structure we wanted was imposed upon the workers and did not arise naturally out of their day-to-day work experiences. To put it bluntly, we had miscalculated their informal work groups. Pete returned to Chicago in late March and we began to implement our strategy. Through a lot of diligent work in Pete’s absence, we had managed to create an almost complete map of the industry and collect the contact information for close to 650 messengers, roughly 45 per cent of the people working in the industry. The near-heroic efforts of messengers made this possible. Pete’s arrival in Chicago kicked the campaign into high gear. With Pete in town, we organized several shop committees. Our plan was to build the union slowly by winning small grievances at individual work places. However, no committee was capable of functioning without an IWW organizer present. Two organizer trainings were held, but they failed to empower couriers to be independent organizers. Despite these weaknesses, the shop committees achieved limited success. Our first victory came when Scott Gibson, one of the members of the IOC, was fined illegally “when he was caught not wearing a company-required uniform” by Standard Courier. Scott only learned about the fine when he saw a $50 deduction from his paycheck. Such deductions are illegal under Illinois law. Scott and the Standard Courier shop committee confronted management, demanded Scott be reimbursed and an end to the uniform policy. Management insisted that the messengers at Standard were independent contractors. The shop committee reasoned that independent contractors could not be required to wear uniforms. Over the course of a week and a half, Scott and six of his coworkers marched on their boss to issue their demands. After the third march, management rescinded the uniform policy, refunded Scott $50 and fired him. During that time the couriers won a small victory at the Comet messenger company. Comet employed primarily black workers. A couple of bike messengers from Comet joined the union and told the IOC that “workers paychecks did not amount to minimum wage.” The messengers began to organize. The threat of organizing pushed management to enforce minimum wage laws. Pete left in June and his absence was immediately felt. MK and I lacked his experience at group facilitation. The organizing faltered and changed direction. We decided to aggressively reach out to driver messengers. Up until this point, participation in the union had consisted almost entirely of bike messengers. We knew we had to bring driver messengers into the campaign if it was to succeed. This effort failed due to different work cultures. Driver messengers are an atomized workforce isolated in their vehicles at work and during breaks. Bike messengers congregate together during their downtime. The bike messenger subculture also can be elitist and alienating to non-members. It was around this time that MK took a job with Arrow as a bike messenger and focussed on building a shop committee at Arrow. His work led to a major campaign to change working conditions and pay. This switch of focus by a key organizer prompted the end of the IOC. The union then decided to concentrate efforts on fighting independent contractor status. In Chicago, and across the country, many messengers are considered independent contractors by their employers. The reasoning of the employers is that messengers are able to decide whether or not they will accept a particular package from a dispatcher and, therefore, are independent. As independent contractors, couriers are responsible for their own taxes, denied workman’s compensation, unemployment insurance and even a right to a minimum wage or overtime pay. Government agencies have mostly rejected the employers’ claim. But most messengers do not know this and so the companies get away with it. The North American Independent Contractor Association (NICA) helps them do it. When a messenger gets a job with a company that uses NICA she or he is told they are contracted through NICA and merely assigned to work for the courier company’s dispatchers. NICA messengers are charged a weekly fee and must pay for using the radio equipment. These fees can be quite high, up to $100 per month. We formed the Stop NICA! committee with the goal to drive NICA out of the industry. The committee would fight NICA on both a legal level, by filing claims for unemployment and workmen’s compensation with the various government agencies as if the workers in question were employees, and through direct action. The Stop NICA! committee hoped to convince companies that they should switch their workers back to employee status and prevent NICA’s spread elsewhere. The committee lasted the summer and had moderate successes, winning five workman’s compensation cases and holding a series of pickets that delayed, but did not stop, NICA from spreading to two companies. Andrea Murphy came onto the campaign as a full-time paid organizer to speed up and focus the work. She decided that it was time “to end the secrecy” that had surrounded the campaign since the beginning. Murphy threw CCU meetings open to all couriers who came. “Every working messenger would have a voice and a vote at meetings, with the exception that only members of the CCU in good standing could vote on money matters,” said Murphy. The CCU elected a secretary, Marshall Arnold, a former Arrow dispatcher who worked at Dynamex. The group held workshops, advocated for messengers to city hall, and organized around grievances and industry issues. Arnold believes that in some ways the union’s biggest accomplishment is that it continues to exist. In Fall 2006, the CCU began a campaign to the get one of the buildings in downtown Chicago, 135 S. Lasalle, to install a messenger center that would allow couriers to easily drop off their packages as reported in the June 2007 Industrial Worker. What is exciting is that this campaign is that is the first major effort spearheaded by the couriers themselves. Nearly four years later, the dream of a solidarity union for the courier industry may be happening. Looking back, we learned five lessons. First is that a campaign initiated by outsiders cannot follow the pure model of solidarity unionism advocated by Lynd. IWW organizers often found their ideas in conflict with the couriers working in the industry. This conflict stifled these workers and slowed the campaign. Second, building a union takes a long time and organizing requires dedication and patience. The CCU is only a success because organizers stuck with it for several years. The industry’s high turnover raises the question of how to create stability for a successful union. Third, informal work groups matters a lot. The union failed to bring in drivers because they belonged to a different set of informal work groups. Fourth, structures must evolve organically. Efforts to create the IOC, the Stop NICA! committee, and the shop committees failed because organizers imposed them artificially onto the industry. The structure of the CCU ultimately succeeded because it reflected the social dynamics of bike messenger culture, which is part of a community. Organizers should pay careful attention to the indigenous forms of organizing that exist and seek to capitalize on them. Fifth, organizers need clear goals. Organizing at Arrow and now around 135 S. Lasalle, has been successful because the organizers had and have both clear goals and a plan of action. This clarity makes it much easier to get people to join in the organizing and understand why it might benefit them.